Hand carved gemstone art pendant framed in forged Argentium silver. One of the best parts about my artwork is the luxury of learning as much as I can about the ocean tides. Recently, I came across a phenomenal word: "Euripus" . A Euripus is a narrow tract of water where the tides and currents flow with force and majesty. At once I realized this unique tide needed to be forged in silver, and this pendant was born. This ocean art pendant captures the ocean at it's most forceful and capricious. Ebb and flow, wave after wave- shall it overwhelm us, or sweep us along to joy untold? 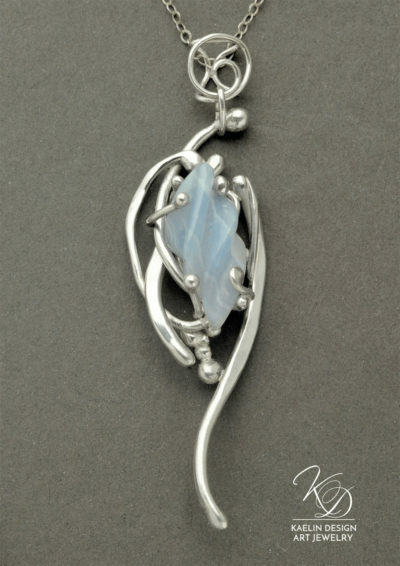 Hand forged in Argentium Silver, Euripus measures approximately 2.5 inches tall, and features a lovely hand carved Blue Chalcedony. This one of a kind pendant includes an 18 inch Argentium Silver Chain, and gift wrapping.